MEDINA, Ohio — Nobody loves Christmas like Mark and Dana Klaus. Four years ago, the couple opened Castle Noel, a year-round Christmas attraction and museum in Medina. With his white beard, Mark even looks like Santa and, yes, Klaus is his real last name. The couple was eager and a little skeptical when they heard about a warehouse located in the shadows of Tower City in the Flats full of the mall’s old Christmas decorations. The warehouse was being emptied so it could be rented out. Everything had to go. A relative of a friend who worked at the warehouse invited the Klaus’ on Monday to rummage through the stuff to see if there was anything worth saving. Do you love Christmas? Are you the type to watch A Christmas Story, Elf, Jingle All the Way, The Grinch, and other Christmas movies even in the heat of summer? The kind of person who stares in awe at the holiday window displays in New York City’s biggest department stores, like Sak’s Fifth Avenue and Bloomingdale’s? If so, then Castle Noel in Medina, OH is exactly the kind of place you need to visit. Mr. and Mrs. Klaus have amassed an enormous collection of movie props and costumes, and the guided tours ensure you see them all. “We have millions of dollars in window displays from New York City, and the largest privately own collection of Hollywood Christmas movie props,” she says. “We have the “I Had That” toyland collection where you’ll find a toy from one Christmas Eve. We have the Blizzard Vortex Tunnel, Santa’s Chimney Squeeze where you can see what it feels like to go down a chimney like Santa, and Santa Klaus Mountain, which is being transformed into the enchanted forest.” Santa even makes an appearance several times a year, mainly during Christmas and July. Don’t think Castle Noel is just for kids, though. Along with the gorgeous window displays and movie props, they have a party room for corporate events, which will certainly put coworkers in the Christmas spirit. And the to date, the oldest person to ride the slide is 101 ½ years old. Mr. and Mrs. Klaus really do embody the goodwill and spirit of the season, going out of their way to ensure everyone can have a good time. In fact, she’s even had people thank her for giving them back their Christmas spirit. “It’s all about making you feel happy and making you feel the magic of Christmas before you leave here.” Having been in a wheelchair in the past, Dana Klaus is especially focused on making sure, no matter your physical ability, that you have fun. “Our attractions are set up for people in wheelchairs.” She once assisted a man in a wheelchair up onto the top of the slide just so he could take a picture with his family, and she gives particular attention to children with Special Needs, telling the guides that they’re her “Gifts from God,” and encouraging them to treat them like honored guests. Originally Published by the Toledo Blade c/o Akron Beacon Journal. MEDINA — This is not your typical museum. For one, its owner looks suspiciously like Santa Claus and runs a place dedicated to the holiday from movie props from Christmas movies to original New York City festive department window displays to vintage toys found under the tree. What makes this place tucked just south of Medina’s historic square particularly special — aside from being chock full of holly, jolly cheer — is that it is constantly evolving. This Christmas season Castle Noel has a lot of new gifts for visitors. Guests, who often this time of the year can be found stretched out the door and down the block waiting to get in, will experience a new impressive entrance the museum that just opened. They still have to venture outside the back door of the storefront gift shop/ticket counter to get inside of the former church turned Christmas museum. But once outside the door, they catch a glimpse of Cousin Eddie’s original RV from the National Lampoon’s Christmas Vacation. As cool as that is, collector and museum proprietor Mark Klaus, is more geeked out about the freshly restored giant nutcracker figures he made for Cleveland Ballet back in the 1990s. When the ballet company pirouetted its way to San Jose, the four 16-foot-tall nutcracker figures bid farewell to their home by the fountains in Tower City. Mr. Klaus said he fought for years to bring them back to Northeast Ohio. Two of the giant figures now call the former Halle Building in Cleveland home and the other two have taken up residence in Medina. The two in Medina — Clara’s toy nutcracker and the Mouse King — are each still in two pieces waiting to be hoisted into place so they will duel over the heads of museum guests as they make their way past the RV and into a new museum entrance. Once inside, visitors are transported to Santa’s home complete with faux wooden beams — it took Mr. Klaus months of work to get each one just right — as they are greeted by a whimsical mailroom that was part of Macy’s window displays in 2013. Mr. Klaus said the tall ceilings in one section that give the appearance of being in a castle are adorned with holly and ivy from another New York City window display. He said the finishing touches are being made to a cool animated cuckoo clock that stands more than 8 feet tall from Lord & Taylor department store that will soon be added to the new entrance area. Truth be told, Mr. Klaus said, he is constantly stopped by visitors who say they don’t remember something on the tour during a previous visit. Spanning some 40,000 square feet, Mr. Klaus said, there is a chance they overlooked it on their stop but chances are it is actually something added to the displays. A good example of this evolving effort is the colorful hallway that is home to Santa’s chimney squeeze. While guests try to wiggle their way through an inflated chimney, music and lights fill the hallway. On the ceiling are thousands and thousand of glass ornaments. Last year there were about 75,000 ornaments, but that number has since grown to around 100,000 as Mr. Klaus works to get the “wow” effect just right. Considering the ornaments are a part of 150,000 glass ornaments Klaus purchased from a Cleveland company that were used to decorate area malls, office buildings and corporate displays — odds are this display too will grow and change in the coming months. Mr. Klaus said each ornament is glued and wired to the ceiling one at a time. There are a lot of things that need repair at Castle Noel and Mr. Klaus and his eager band of elves with some electrical experience are up to the challenge. Most of the window and store Christmas displays arrive in the workshop in various stages of disrepair. From missing fingers to water soaked props, Mr. Klaus said, they spend hours and hours restoring each item back to its original glory. This is particularly true of the store window displays that were designed to “live in the moment” as gifts to the shoppers of New York with no plans to ever put them on display again. Often they were simply destroyed or dismantled and stored for parts, Mr. Klaus said, before he began negotiating with the designers and stores to preserve them and put them on display at the museum in Medina. The workshop area where guests are invited to see the restoration effort first hand is being converted into a special event room and will be home to an elaborate 2015 Lord & Taylor window display of a bakery full of Christmas pastries complete with a long conveyor belt of treats. “People love to see all this stuff and how we put them all back together again,” he said. There is more to this collection — another warehouse full to the rafters in Medina — still waiting to be unEarthed and restored. Mr. Klaus — who in addition to running what is billed as “America’s Largest Year Round Indoor Christmas Entertainment Attraction” also handcrafts Christmas ornaments and gifts that have been featured on the Home Shopping Network — love for Christmas started with his dad who would create elaborate displays in the family home. That creative spark, Mr. Klaus said, is what fuels Castle Noel. He said he is always looking for ways to changes things up on the tour from adding some singing Disney-like characters acquired in London to negotiating to be the permanent home to the original TV set for Cleveland holiday legend Mr. Jingeling. 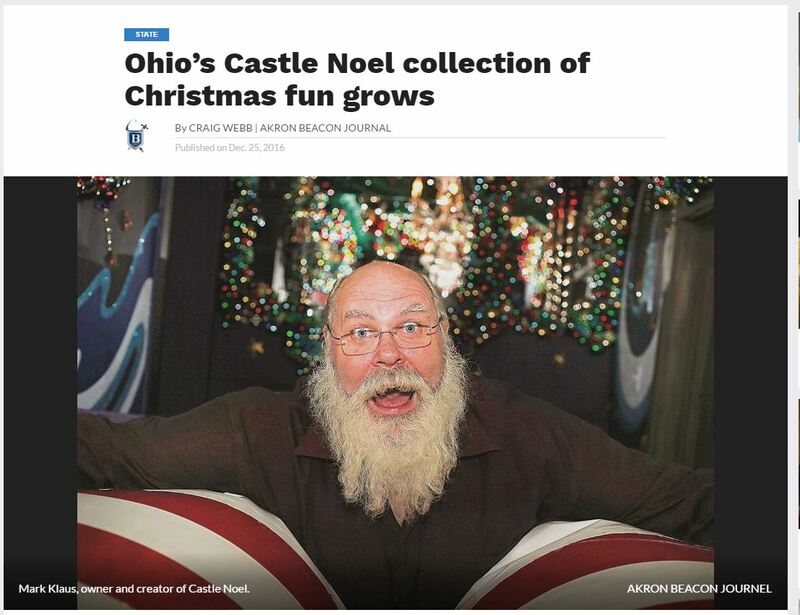 Castle Noel owner Mark Klaus said he has spent millions of dollars to acquire what is believed to be America’s largest year-round, indoor Christmas attraction. “Actually, we’re just a big family project gone wild,” he said Thursday as Castle Noel hosted the monthly meeting of the Medina County Economic Development Corp., a nonprofit business group. Klaus said he has grand designs for his property, which reaches to the intersection of South Court Street and East Smith Road at 260 S. Court St.
“Someday, we hope to have a boutique hotel on the corner,” he said. He’d also like to add a two-level parking deck. “We could increase our bus business by multiples if we can get that hotel for people to stay in,” Klaus said. His wife, Dana, said in the last week, four Anderson bus tours visited Castle Noel, located at 260 S. Court St. After the tour of the Christmas museum, people visited Root Candles, Miss Molly’s Tea Room, Dan’s Dogs and Cool Beans, among others. 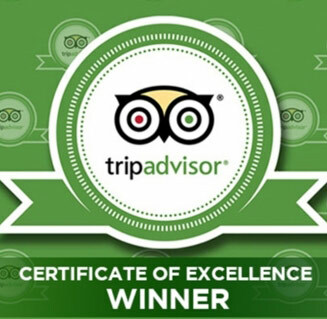 One tour group stayed in Medina for five hours. 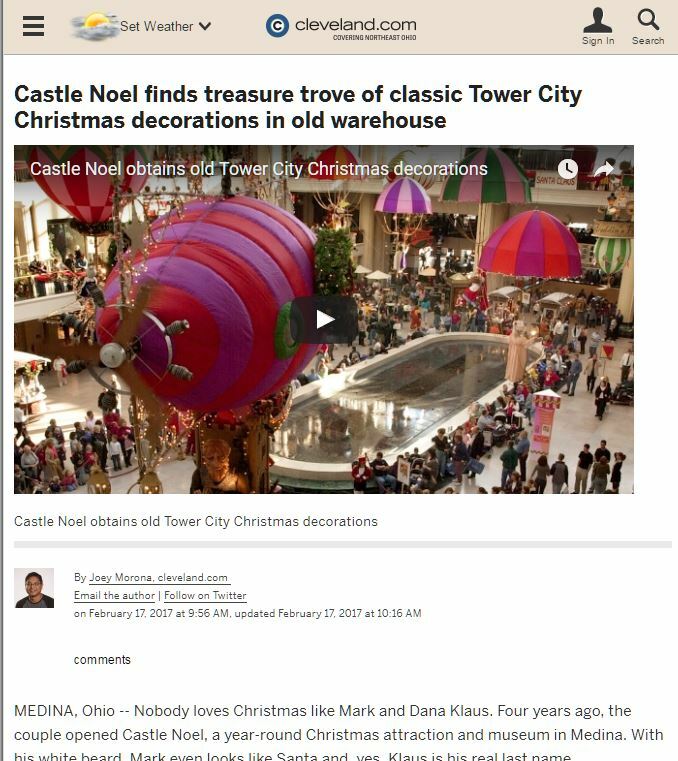 “That’s what Castle Noel does,” Dana Klaus said. “We wanted to find a place where we could get people to come from all over the Midwest and all around the country,” he said. Klaus spent 23 years selling artwork on the Home Shopping Network and QVC where he likely honed his outgoing behavior and flair for the dramatic. He said the impetus of Castle Noel came from his grandfather and father. Both used to decorate in astonishing ways, including the time his father chained a Christmas sleigh to the ceiling of his living room. Klaus said his favorite day was when his father’s cousin, who was a nun, would bring all her fellow nuns over to the house around Christmas. Castle Noel (which costs $17 for visitors on weekdays, $18 on weekends), Alien Vacation Mini Golf ($11) and a gift shop populate the complex. Klaus said Castle Noel once had a 101-year-old woman ride the slide. She showed up to Castle Noel in a wheelchair and insisted on riding the slide. He said he asked her is this is something you really want to do. “‘I’m 101 years old, I’ll do what I want,'” she replied. “So I shoved her down the slide. This is not your typical museum. For one, its owner looks suspiciously like Santa Claus and runs a place dedicated to the holiday from movie props from Christmas movies to original New York City window displays to vintage toys found under the tree. Tucked just south of Medina’s historic square, what makes this place particularly special — aside from being full of holly, jolly cheer — is that it is constantly evolving. Mark Klaus, owner and creator of Castle Noel, stands in the new entranceway that has wheelchair accessible ramps. This Christmas season, Castle Noel has a lot of new gifts for visitors. Guests will find an impressive entrance that the museum just opened. At this time of year, guests can be found stretched out the door and down the block waiting to get in. They still have to venture outside the back door of the storefront gift shop/ticket counter to get inside the former church turned Christmas museum. As cool as that is, collector and museum proprietor Mark Klaus is more geeked out about the freshly restored giant nutcracker figures he made for Cleveland Ballet in the 1990s. Klaus said he fought for years to bring them back to Northeast Ohio. Claras toy nutcracker and the Mouse King are still in pieces waiting to be hoisted into place at Medina’s Castle Noel. Once inside, visitors are transported to Santa’s home complete with faux wooden beams — it took Klaus months of work to get each one just right — as they are greeted by a whimsical mailroom that was part of Macy’s window displays in 2013. A Christmas display from Macy’s is one of the new items at the entrance of Castle Noel in Medina. Klaus said the tall ceilings in one section that give the appearance of being in a castle are adorned with holly and ivy from another New York City window display. Truth be told, Klaus said, he is constantly stopped by visitors who say they don’t remember something on the tour during a previous visit. Spanning some 40,000 square feet, Klaus said, there is a chance they overlooked it on their stop but chances are it is actually something added to the displays. One ceiling is decorated with thousands and thousands of glass ornaments. Last year, there were around 75,000 ornaments, but that number has since grown to around 100,000 as Klaus works to get the “wow” effect just right. The ornaments are a part of 150,000 that Klaus purchased from a Cleveland company that were used to decorate area malls, office buildings and corporate displays. Odds are this display, too, will grow and change in the coming months. Klaus said each ornament is glued and wired to the ceiling one at a time. In one of the rooms at the Castle Noel in Medina are around 100,000 glass ornaments glued and wired to the ceiling. There are a lot of things that need to be repaired at Castle Noel, and Klaus and his eager band of elves with some electrical experience are up to the challenge. From missing fingers to water-soaked props, the crew spends hours and hours restoring each item back to its original glory, Klaus said. Often they were simply destroyed or dismantled and stored for parts, Klaus said, before he began negotiating with the designers and stores to preserve them and put them on display at the museum in Medina. The Sweets Shoppe display case is one of many new features at Castle Noel. 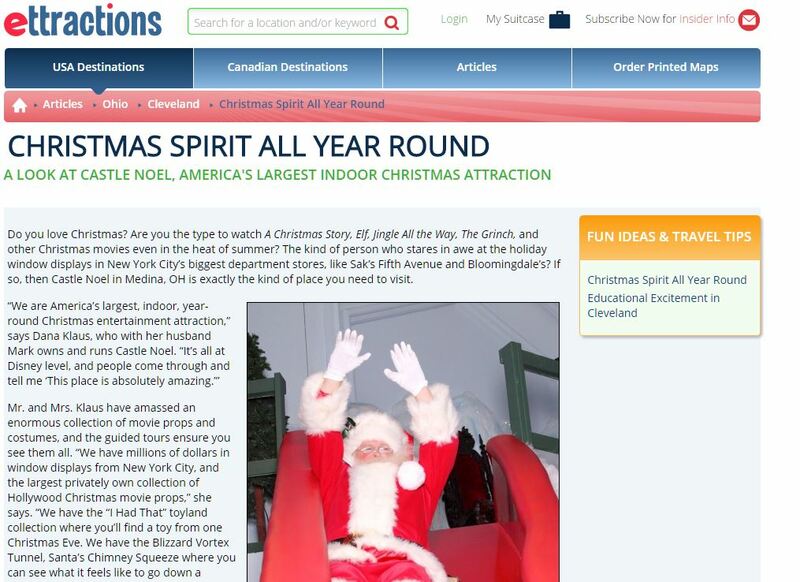 In addition to running what is billed as “America’s Largest Year Round Indoor Christmas Entertainment Attraction,” Klaus also handcrafts Christmas ornaments and gifts that have been featured on the Home Shopping Network. His love for Christmas started with his dad who would create elaborate displays in the family home. That creative spark, Klaus said, is what fuels Castle Noel. He said he is always looking for ways to change things up on the tour — from adding singing Disney-like characters acquired in London to negotiating to be the permanent home to the original TV set for Cleveland holiday legend Mr. Jingeling.